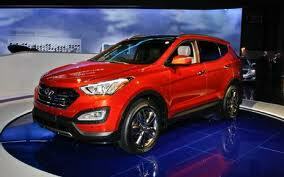 The Santa Fe crossover utility vehicle (CUV) has been named one of the top 10 new models for 2013 by Total Car Score. Angelenos in need of a full-sized sport utility vehicle with excellent fuel economy for its class and a competitive price should check out the all-new 2013 Hyundai Santa Fe. On August 27, Hyundai Motor America announced that the Santa Fe crossover utility vehicle (CUV) had been named one of the top 10 new models for 2013 by Total Car Score. The vehicle was named ninth out of more than 30 new models hitting dealerships this fall. The all-new 2013 Santa Fe crossover utility vehicle (CUV) comes in two flavors: the Santa Fe Sport and its new big brother, the longer wheelbase, three-row, seven-passenger 2013 Santa Fe. Both are designed for today’s family, with flexible seating and cargo areas; in addition, both sport Hyundai’s visually impressive “Fluidic Sculpture” exterior design. Both offer excellent performance due to efficient power plants and weight reduction. The 2013 model weighs 266 pounds less than the 2012 model. The all-new 2013 five-passenger Santa Fe Sport will appear at LA dealerships this month. Those interested in the larger model will have to wait until January 2013. The Santa Fe Sport is powered by a four cylinder Theta II 2.4-liter Gasoline Direct Injection (GDI) engine, which puts out 190 horsepower with improved fuel economy and acceleration. It is rated at 22 MPG city and 33 MPG highway. A turbo version of the Theta II 2.4 liter is also available. It churns out 264 HP with only a slight mileage hit (21 MPG city and 31 MPG highway). The brawnier Santa Fe has a Lambda II 3.3literGDI V6 under the hood. EPA mileage is 19 MPG city and 26 MPG highway—not bad for a large vehicle that pushes a lot of air. All the engines are mated to Hyundai’s six-speed automatic transmission with SHIFTRONIC® manual control. According to Hyundai, this transmission offers smooth shifts and a wide ratio spread that suits the engine’s characteristics. An automatic transmission warmer is included to keep the transmission oil at its optimal temperature, which improves real-world fuel economy. In essence, one has the choice of a sportier vehicle with better fuel economy or a larger capacity vehicle with a thirstier engine. Hyundai notes that the three-row Santa Fe increases second-row legroom by 1.9 inches and cargo capacity 5.6 cubic feet; in addition, it houses second-row HVAC controls and vents to increase family comfort, while also offering a standard 50:50 split folding third-row bench seat with 31.5 inches of legroom. An available option for both Santa Fes is Active Cornering Control All-Wheel-Drive (ACC AWD) system that cooperatively controls engine torque and braking in conjunction with the Vehicle Stability Management System. Hyundai notes that this system can anticipate traction requirements and deliver additional stability through braking via continuous monitoring of driving conditions compared with other AWD systems, which can only react to conditions after they occur. All AWD Santa Fes access an intelligent control unit that continuously analyzes data from the vehicle controller, and through a multi-clutch plate distributes torque to any single wheel at a time. The coupling system is fully controllable via an electro-hydraulic actuation system. Braking force can also be sent to any single wheel at a time via the software. These processes are known as torque vectoring and torque braking. All this analysis is completely transparent to the driver. For further information regarding Hyundai vehicles, click on this link. For more information regarding Total Car Score, click on this link. The weak link of any car with sporting intentions, generally speaking, is the tires that it’s saddled with from the factory. When you think like an automaker, this makes sense – adding stickier rubber costs significantly more that cheaper tires purchased in the thousands, and then there’s the issue of customer satisfaction to deal with. Early Acura NSX buyers filed suit against Honda when they realized that the stock high-performance tries on the NSX only delivered around 10,000 miles of tread life. Since then, manufacturers have shied away from giving us the good stuff, unless it’s sold in an add-on “summer tire” package. 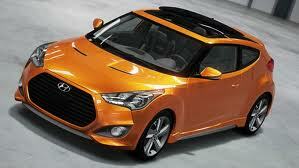 According to Autoblog, Hyundai will soon offer up a summer tire package for its sporty Veloster. The word comes from none other than John Krafcik, Hyundai Motor America’s President and CEO, who insists that stickier rubber has been in the planning stages for Veloster since the car was released. For an additional $1,200, Hyundai will sell you a set of Michelin Pilot Super Sport tires (as long as you have the 18-inch wheels), which are capable of 0.94 gs of lateral acceleration, compared to 0.82 gs from the base Kumho Solus tires. Stopping distance on dry pavement is cut from 135 feet at 60 mph to 121 feet, which is probably the best way to sell your significant other on the idea. If you need more justification, consider this: Michelin Pilot Super Sport tires are what we run on our own cars at Automotive Addicts. Hyundai has updated its enjoyable Genesis Coupe for 2013 with sharper styling, improved interior and more power, bringing the sporty machine further into focus. Genesis Coupe, which basically took the place of the Tiburon in 2009 and has nothing at all to do with the Genesis sedan, also surprises with a new eight-speed automatic transmission, the kind of sophisticated setup usually reserved for more-expensive cars. But isn’t that Hyundai’s advantage, offering drivers more for less? The rear-wheel-drive Coupe continues that trend, competing with confidence against V6 versions of Mustang and Camaro, and the Nissan 370Z. New rivals that are getting a lot of attention are the near-twins Scion FR-S and Subaru BRZ, sophisticated rear-wheel-drive coupes that have stepped up the game with their sports-car handling. Midsize sporty cars with just two doors have become a niche group, but Hyundai moves ahead with its entry geared toward driving enthusiasts and compact tuners. I drove the fully loaded Coupe in the upper-end Grand Touring edition with a 348-horsepower V6 and automatic, which costs a relatively modest $32,000, plus shipping. The well-equipped base model with a 274-horsepower turbo four and six-speed manual is just $24,250. Even the top-dog Track version equipped for club days on the circuit tops out at $34,250, with just a bit more for the R-Spec treatment. That’s a lot of head-turning sports coupe for the money, backed by the best warranty program in the business. And the power gain is significant, up 64 horsepower for the turbo four, and an increase of 42 for the V6. A major improvement for 2013 is the Coupe’s handling, which feels better composed and more responsive than the previous version. The steering feels more precise, but still numb to driver feedback. The four-wheel Brembo disc brakes are highly effective. The 3.8 is strong and willing, though somewhat noisy even under moderate throttle, and setting up a sonorous racket under hard acceleration. It has plenty of power, but what a roar. The V6 is designed to run on premium fuel, but according to the spec sheet, there’s just a minor performance penalty if you cheap out and buy regular instead. 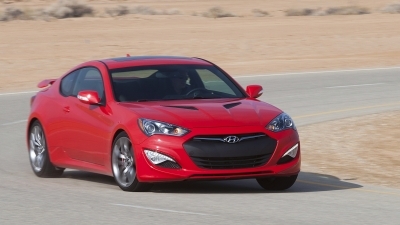 The eight-speed transmission helps the Genesis Coupe gain fuel mileage, and it works fairly smoothly. It does feel like it’s shifting constantly, all the more noticeable because of the engine noise. A six-speed stickshift is still available. Mileage is 18 city and 28 highway for the V6 with automatic, about on par with the competition. With the 2-liter turbo four and stickshift, mileage moves up to 21 city and 30 highway. The styling looks agreeably aggressive, although I don’t care for the broad hunk of flat-black plastic in the grille. And those black-plastic inserts that look like scoops up on the hood are just too blatantly fake. Otherwise, the styling is a nice update of the classic coupe form, with good proportions and contours, and a solid stance. The interior is much improved, mainly the seats that are more comfortable and supportive. The dashboard shape takes some getting used to, but it’s all very functional with the always-appreciated physical dials and controls for audio and climate rather than having to poke at the video screen. The materials and execution seem high quality, better than you’d expect in this price range; the jury’s still out on the stitched-seam effect. Now, there are three dials situated low on the center console, way out of the driver’s line of vision that compete with each other for uselessness. They are: a wildly flipping fuel-economy gauge, a torque gauge of questionable worth at best, and an oil-temperature gauge, which I suppose would have some value on the track. But wouldn’t a coolant-temperature gauge be a lot more useful? There is none. I’m still trying to figure out what that torque gauge is for; for the turbo model, it becomes a turbo-boost gauge. If Hyundai insists on having three faux-sporty gauges, why not at least make them worthwhile, such as cooling system, oil pressure and amperage? The Grand Touring model comes fully loaded without any ala carte options, and includes leather seats, full power features, navigation, Blue Link telematics, Bluetooth, keyless entry and start up, automatic climate control, sport suspension, 18-inch alloy wheels and an excellent 360-watt, 10-speaker Infinity sound system. With shipping, it came out to a reasonable $32,875. Aside from the engine roar and a few sporty affectations, Genesis Coupe shows new refinement that was lacking in the last version, while the added power comes without a fuel-mileage penalty. It’s a fun car to drive, modestly priced and I can see it growing in popularity among young enthusiasts. Vehicle type: Four-passenger, two-door coupe, rear-wheel drive. Engine: 3.8-liter V6, 348 horsepower at 6,400 rpm, 295 pound-feet of torque at 5,800 rpm. EPA mileage rating: 18 city, 28 highway, 22 combined. For the past nineteen years, a jury of expert automotive journalists get together with one very tough goal to accomplish: determine which car is worthy of an exceedingly prestigious award. Each candidate for the North American Car of The Year trophy must be new as well as innovative, impactful, satisfying to drive, hold excellent value for the money spent and carry a level of design, safety and handling to make the car memorable. After the carefully selected panel of judges narrowed down more than 50 entries to just three competitors, a final winner was selected. Beating both the 2012 Volkswagen Passat and Ford Focus and earning the title “2012 North American Car of The Year” is the Hyundai Elantra. “In a year with some truly breakthrough competitors, we are honored that the jury recognizes Elantra’s far-reaching impact on the industry,” said John Krafcik, President and CEO for Hyundai Motor America. The first compact car to adopt Hyundai’s ‘Fluidic Design’ philosophy that spawned the Sonata and Genesis model line, the Elantra is an inexpensive, efficient and tidy car that doesn’t necessarily look the part. Envisioned by Hyundai’s North American Design in Irvine, California, the Elantra a remarkably low drag coefficent (.28) meaning that not only is it attractive, but it slices through the air with ease. Add this to the efficient 1.8 liter inline four cylinder and 40 mpg can be achieved without the help of hybrid assists. In 2011 alone, the little Hyundai became rather popular earning a total of 186,361 sales and with its new found swagger as North American Car of The Year, the Elantra should cruise effortlessly through the new year.